I honestly didn't think I'd like this film and, after about 10 minutes, I paused the DVD and went to look for whichever marbles I'd obviously lost for purchasing it in the first place. Turns out I have no marbles. It's George Clooney, a real favourite of mine, hamming up the part of a TV presenter worse than when he hammed up Batman! After the tears had stopped and I realised I had nothing better to do with my life, I continued watching and... it got good. Very good. 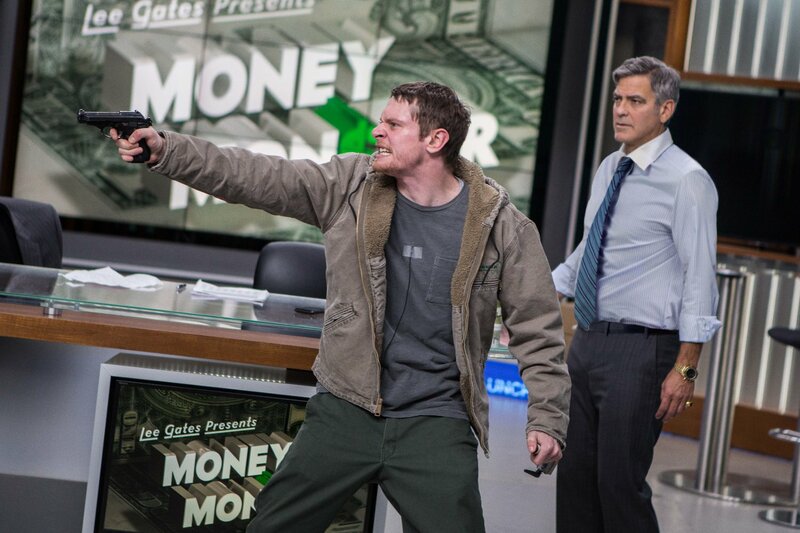 Clooney was incredibly watchable as financial TV host Lee Gates and it turns out he wasn't hamming up the role as, apparently, American TV presenters are actually that loud and cheesy and Clooney is spot on in his portrayal. 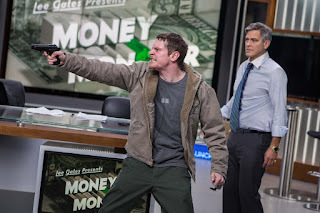 After ignoring his producer, Julia Roberts as Patty Fenn, over some talking points regarding a company whose stock he had told people to buy, Lee finds himself being held hostage live on TV by someone who lost all his money in the stock. Enter Jack O'Connell as Kyle Budwell. Budwell's mother had recently passed away and he'd invested all his inheritance in the aforementioned stock, lost everything and blamed the CEO Walt Camby (Dominic West) and Gates for advising the purchase. With nothing left to lose, Budwell had sneaked into the studio carrying two packages and a gun. The packages contain bomb vests but the CEO who was supposed to be on the show was AWOL, with even his company not knowing where he is, leaving Gates on his own in the hands of a desperate man. Gates tries in vain to compensate Budwell himself, he tries using the fact that they now have a global audience to get the company’s stock back up to cover the losses which are explained by the company communications representative, Diane Lester (Caitriona Balfe), as a glitch in their algorithm. Something doesn't ring true about that excuse for any of the people involved. Gates knows the markets don't work like that, Fenn sniffs a story, Budwell thinks it's too easy to blame a computer and Lester thinks her boss is hiding something, whilst the NYPD seem hellbent on shooting Gates so the bomb vest won’t go off. Gates eventually uses Budwell as a team mate and they take their little hostage situation out onto Wall Street for a showdown with Camby who, it turns out, is trying to bribe a South African Union official and has used the $800million missing through that "glitch" to buy platinum mines on the cheap. The face off happens but it doesn't end as you think it will. I can see promise in Jodie Foster's film, I laughed out loud at much of it. Then I went to IMDb to select an image to accompany this article and discovered that Money Monster is billed as a drama/thriller; that, it is not. The story is an exaggeration of what we would all like to do to those in finance, who seem to forget they have human accountability, but it doesn't play out like a thriller, more a dark comedy. If it had been marketed as such it may have got better response. It's not the best financial scam film on the market but, as a performance piece by a top cast, it's great comedy. Jack O'Connell is especially good even if his accent wavers occasionally. So, ignore the thriller tag and watch it for the laughs and it's better than you think it will be.